This has become my salad of the summer. More specifically, this basil vinaigrette has become my salad dressing of the summer. I love basil. When it’s in season at the farmers market I come home with a big bunch of it every week. I, like most people, usually use it to make pesto or sprinkle shreds of it over panzanella or caprese or a simple pasta with olive oil and tomatoes or pizza Margherita (umm, and if you’re making pizza, you should be using this pizza dough). But I had never before blitzed it with extra virgin olive oil and vinegar into a light and verdant vinaigrette. This basil vinaigrette comes from the Rebar: Modern Food Cookbook by way of Jeannette’s charming blog. Unburdened by nuts and cheese, it’s lighter and brighter than pesto with an acidic zing. I’ve been drizzling it over everything. In addition to the basil, some of my other late summer favorites have come into season. Tomatoes are finally here along with some incredible varieties of cucumbers. 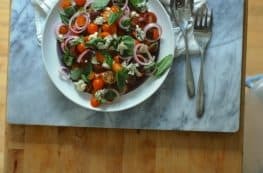 (And if you’re looking for more tomato salad recipes, you might try this tomato, roquefort, red onion number. 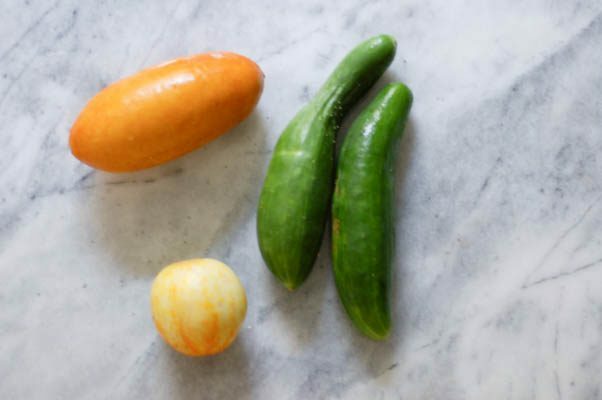 I especially like the long green Japanese cucumbers, the muted orange oblong poona kheera cucumbers, and the pale yellow orb-like lemon cucumbers. These varieties are all sweeter, crisper, and juicier than the cucumbers I tend to find at the supermarket. Though they look quite different, you can treat them like you would any cucumber–just peel and slice. 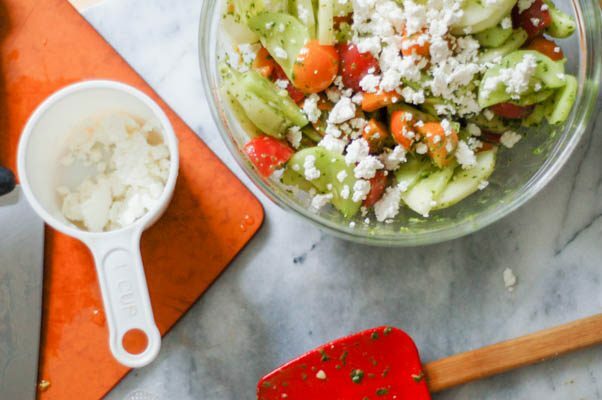 I love the way the crunch of the cucumbers plays off the juicy tomatoes and the vibrant vinaigrette and the creaminess and tang of the crumbled feta. I’ve already made this four times in the last two weeks, which might be a record for anything other than pizza. And I have another bunch of basil waiting on the counter just tempting me to make more. The basil vinaigrette is the star of the show here. 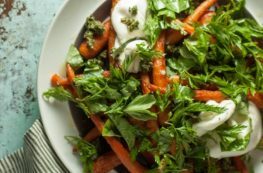 This recipe makes more than you’ll need for this salad, but not so much that it will go bad before you can reasonably consume it (in my experience it keeps for about 4-5 days). I’ve used it to dress a shaved zucchini salad and a simple green salad. It would also be great on panzanella or as a spread on a tomato sandwich. I’ve used a mix of cherry tomatoes (including my favorite sun golds) here, but obviously, large tomatoes would work just as well if they’re cut into bite-sized pieces. If you can get your hands on local seasonal cucumbers, that’s probably your best bet, but use any cucumbers you like. It will be fine with any variety. The feta is optional, but it adds a nice creamy richness to the light salad. The quantities here are all approximate. I tend to eyeball ingredients when I’m making salads rather than measuring out specific amounts, so that’s reflected in the recipe. Make the vinaigrette. In the bowl of a food processor (or in a blender) add the garlic, Dijon mustard, honey, red wine vinegar and salt. Pulse until the garlic is finely minced and everything is well blended. Add the basil and pulse until combined. (If the basil isn’t cooperating, add some of the extra virgin olive oil to help things along.) With the motor running, drizzle in the olive oil, and blend until the mixture is emulsified. (If you’ve overdone it with the basil and the mixture looks too thick to dress a salad, add a little more olive oil to thin it out.) 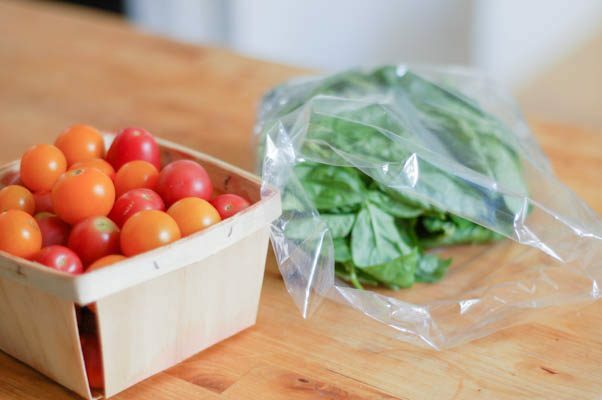 Set aside (can be stored in an airtight container in the refrigerator for 4 to 5 days). Make the salad. In a medium mixing bowl, combine the sliced cucumbers and cherry tomatoes. Season with a pinch of salt. Add a few tablespoons of vinaigrette and toss until the tomatoes and cucumbers are well coated. Add more vinaigrette, a little at a time, until it’s dressed to your liking. Add the crumbled feta, and stir until well distributed. Taste to see if it needs more salt (this will depend on your feta). Serve immediately. 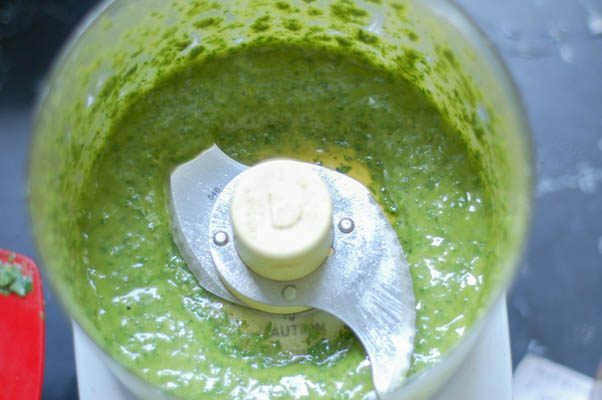 Oooh, I’ve been thinking about this basil dressing for a while now! Thanks for the reminder that I should be making it more 🙂 Glad you enjoyed it! This salad is so similar to the salad my parents make daily, it actually makes my joint ache with longing… A perfect way to celebrate the first flavours of summer! Thank you, Ksenia! What kind words! I can see why this basil vinaigrette has become your go-to dressing this summer. Sounds amazing! 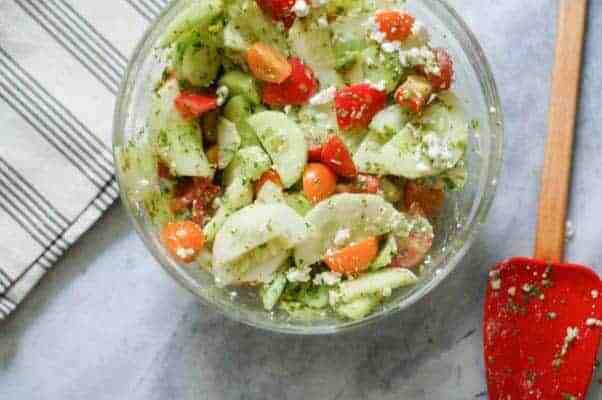 Love the combination with the tomatoes, cucumbers, and feta. Thanks, Tara! I find it kinda addictive. Yum! That basil vinaigrette with honey and Dijon sounds amazing! 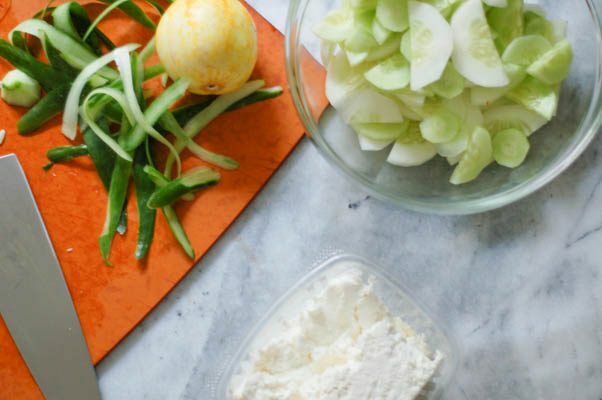 I adore cucumber salads, especially in the summer, so I can’t wait to try this ASAP! Yeeeees!! 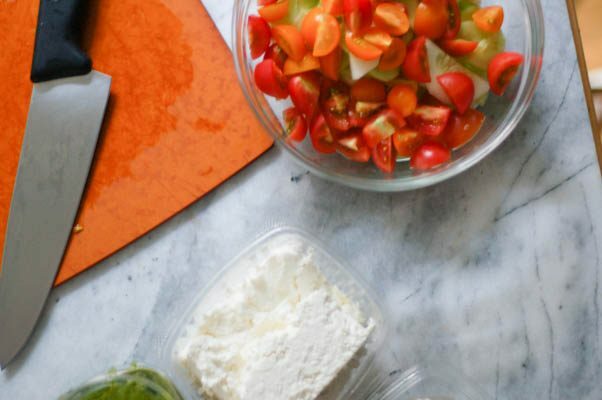 Summer salads are my favorite, and this sounds like such a good one. 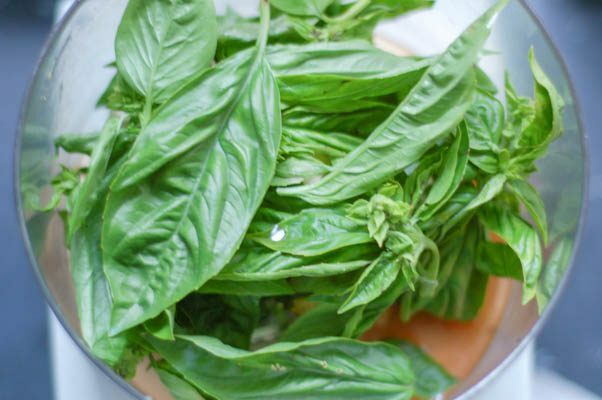 It looks so delicious and tangy, and I’m dying to try that basil vinaigrette! Thanks, Tracy! I can never get enough of this one. I must try that vinaigrette! 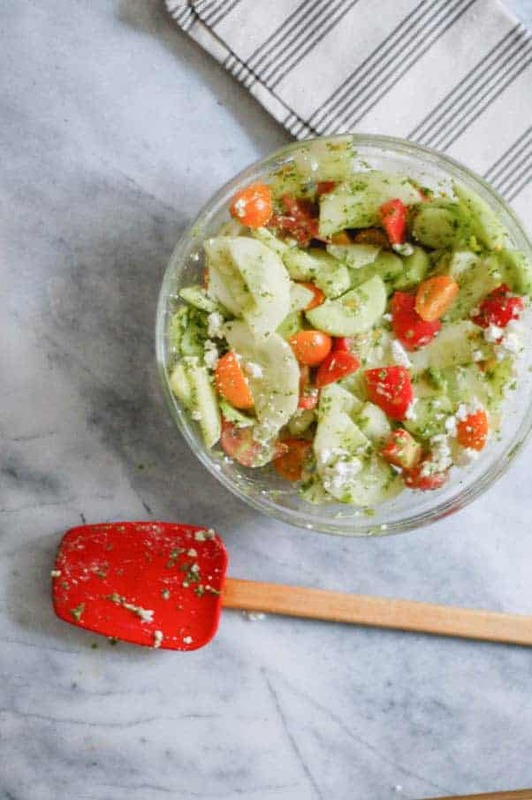 We love cucumber salad and all the flavours you have added here. Perfect for this balmy weekend! Thanks, Jacquee! It is totally perfect for summer weather. So light and refreshing.